From grocery stores to electronics retailers, customers are griping about the length of receipts. 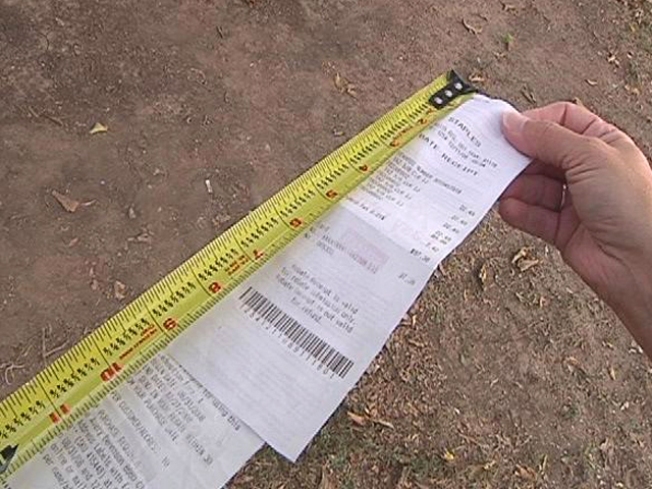 From grocery stores to electronics retailers, customers have a new pet peeve: the length of receipts. "They put stuff on there that is just not needed in everyday life for your transaction," said Jack Britton, 24, an accountant in Dallas. "I'm not going to do the survey. I don't need a customer number in case I file a complaint about the Sprite I bought." Receipts have been around for more than a century and provide valuable information -- a record of what you bought and how much you paid. But increasingly, they are loaded with surveys and coupons and information on return policies. "Sometimes, they're a waste of paper," said another customer outside a Fort Worth Walmart. Buy three bottles of water at an Albertson's grocery store, and the receipt is 10 inches long. Need a rebate form from an office supply store? 22 inches. "The prices should be on here," said one man loading groceries into his car. "But they probably should have cut it right there," he said as he tore the receipt in half. Josh Walsh, a customer service representative at the Best Buy at Central Expressway and Walnut Hill in Dallas, said he hasn't heard any complaints. "I have never heard that our receipts are too long since I've worked here, so that's new to me," he said. Walsh said the information on the receipts, such as return policies and store addresses, is important. "Here at Best Buy, all the stuff that's on the receipt is essential for our customer to know," he said. But is it all really essential? One grocery store chain offers coupons on the back of receipts for getting your hair cut. "I think it's a waste of paper," one customer said. "Honestly, smaller sheets would be better for me. All I do is throw it in the trash anyway." Britton was featured in a Wall Street Journal article on the receipt controversy Wednesday. "It's ludicrous some of the stuff they put on there," he said. "It's not like I care!"